Formerly known as the Queen Charlotte Islands, Haida Gwaii is a complex of over 150 islands, totaling about 10,000 km2, off the coast of British Columbia. They lie between Vancouver Island to the south and the islands of southeast Alaska to the north. There’s a story behind the book’s title, but I won’t spoil things by telling it here, other than to say that the American writer, John Steinbeck, was involved. Bryce Kendrick is a retired professor of mycology and author of the popular text, The Fifth Kingdom. The other three co-authors are regionally well-known amateur mycologists who have carried out a number of mushroom surveys in different parts of British Columbia. This is not a field guide, but a field-guide-sized eclectic presentation of the mushrooms of Haida Gwaii, based mostly on the results of a 5-year survey conducted by the authors. It begins in field-guide fashion with a chapter that introduces mushrooms — what are fungi, mushrooms, ascomycetes, and basidiomycetes, how fungi get their energy, and their roles in forests. The second chapter describes Haida Gwaii. This is followed by chapters dealing with the uses of mushrooms by the Haida people (one of Canada's "first nations"), the edible mushrooms of the archipelago, commercial harvest of edible mushrooms, and species accounts of some of the edible mushrooms. 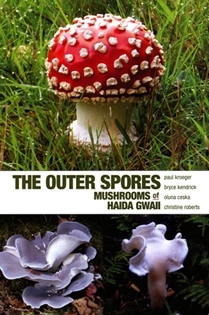 The focus then shifts from edibility, with chapters covering species accounts of selected noteworthy mushrooms, some interesting ecological aspects of Haida Gwaii mushrooms (including the truffle lifestyle, sand dune mushrooms, and the “ammonia fungi” or “corpse-finders”), poisonous mushrooms of the area, “magic” mushrooms, atlas (photographs) of some of Haida Gwaii's mushrooms, and a summary of the 5-year survey project. The book closes with a bibliography, nutshell author bio’s, a very useful species list, and index organized by common name and genus. The book is informative, well written throughout, and provides a look at not only the mycota of Haida Gwaii but that of the coastal spruce-hemlock forests and shore pine muskegs of the broader region as well. Of most interest to me was the summary of the results of the 5-year survey (for those with similar interest, a draft technical report has been prepared and is expected to be finalized in the near future, now that the popular book has been published). During the survey over 2,900 collections were made, representing 615 species. As has proved to be the case with similar studies elsewhere, many new species were collected each year, the species total was continuing to climb at the end of the survey, a relatively small number of species (31) was found in all five years, and most species (378) were found in only a single year. The most common genera were Cortinarius, Russula, Mycena, Inocybe, and Lactarius. National Park access regulations restricted collecting to the early were found, suggesting that there are many more late-season fruiters awaiting documentation. About half of the species are ectomycorrhizal ones. In reviewing the species list, I was struck by the paucity of identifications to genus-only. Even in genera as notoriously difficult and under-studied in North America as Cortinarius and Inocybe, every one of the 71 and 32, respectively, taxa on the list was identified to species with no sensu lato’s, cf’s, or aff’s (all indicators of a degree of uncertainty in applying names). This suggests to me that some of those names, especially the European ones, should be taken with a grain of mycological salt. In the atlas chapter, there are approximately 140 color photographs illustrating about 100 species, including two slime molds and a few ascomycetes with very small fruitbodies. There are also a few shots of microscopic features. The size of the photos varies, with most being between 2 and 3 inches in long dimension. There are some very nice shots but overall the photos are not up to the standard of most recent field guides. The lighting or focus is poor in several, color is poorly rendered in some, others don’t show the features necessary to identify the species (although perhaps the authors did not intend them to be used for identification), and a large number are of mushrooms being held in someone’s hand. In addition to this collection of photos, most of the other chapters are illustrated with color photos, maps, and charts. There are several maps that show the general physiography of the archipelago, sites visited during the survey, sites where particular species were found, and so forth. It would have been nice also to have a map showing where Haida Gwaii is relative to the B.C. mainland, Vancouver Island, and southeast Alaska, and to have the locations of the individual islands, communities, and other places that are mentioned in the text indicated on one or more of the maps. The Outer Spores will provide mushroom hunters in the Pacific Northwest with a useful secondary resource when trying to identify fungi found in habitats similar to those of Haida Gwaii—in particular the species list will provide some possible suspects to consider and then these can be tracked down in other field guides, Pacific Northwest Key Council keys, or the computer program, MatchMaker (both of the latter resources available for free download at the South Vancouver Island Mycological Society website. It also provides a good look at what visitors to the area are likely to find and allows armchair forayers to get a sense of the regional mycota. However, it might have even greater value in showing what a small group of dedicated people can do to document the mushrooms of an area. If the North American Mycoflora project is to become a successful reality, groups such as mushroom clubs will have to embark on similar projects throughout the continent and the Haida Gwaii study is evidence that such projects can be done. The Outer Spores is well worth adding to your library. This review was published in the May-June 2013 issue of The Mycophile. Reviewer's Note: In my review of The Outer Spores: Mushrooms of Haida Gwaii, published in the May-June 2013 issue of The Mycophile, I expressed my surprise that every species of Cortinarius and Inocybe in the survey project’s species list was confidently named, with no qualifiers such as "cf." attached. One of the authors recently informed me that, indeed, they did have a number of qualified names on the original list but removed them at the publisher’s request.